If you find yourself on Isla Mujeres, I recommend finding Zama Beach and Lounge. We recently spent a day on the island and stumbled upon this place, unfortunately at the end of the day, so we only had time for some cocktails, a beautiful sunset, and then we raced back to town to return our golf carts and jump on the last ferry home to the mainland. We all agreed that had we known of this place, we probably would have spent the whole day there (except for visiting the ruins at the south point). To get there you take the road down past the turtle sanctuary and its on your left. Finding this place was like stumbling into paradise. A beautiful bar next to a small private beach looking out across the water towards Cancun. A swimming pool, massage area, beach chairs. Perfect music, fabulous cocktails and great service. You can go and spend the day there hanging out on the beach, swimming in the ocean and pool and enjoying great service. It was so nice that we thought it was a private club, but we were told you only need to spend a minimum of $20 to hang out there, which is not hard to do (2 cocktails or a few drinks). You can make reservations and I am sure the place gets rented out frequently to wedding and other parties.We did not try any food, but I am sure it was good, and it looks like it would be a beautiful dining/bar scene at night. I think the beauty of Isla Mujeres is that in spite of continuing growth and tourism, you still can get a small island, local, Mexico, beach feel if you look for it, and there are other places I would recommend for that. Zama is not that. Zama is a high end kind of place, and not what you want if you are looking for a more local feel. This is where you go when you just want to chill out in a small, more private space and listen to lounge music and drink really good top shelf cocktails. And sometimes that is what I want to do. Next time we are down here we are definitely spending a day on Isla Mujeres and definitely spending a lot of it kicking back at Zama. 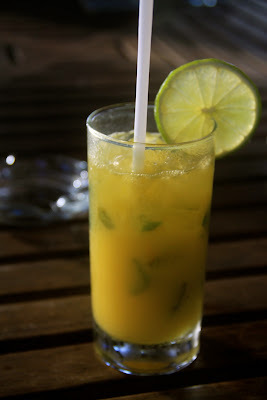 Ask for the mango mojito. I don't typically like to mess with the original, but this recommendation from our waiter was fantastic.